Bring your hoop dream to life with our custom hoop listing. The only option you will choose from the drop down menus are diameter. Everything else you must write in the notes during checkout! We can combine up to two performance tapes as well as any grip tape you desire to create a hoop designed by you, for you! 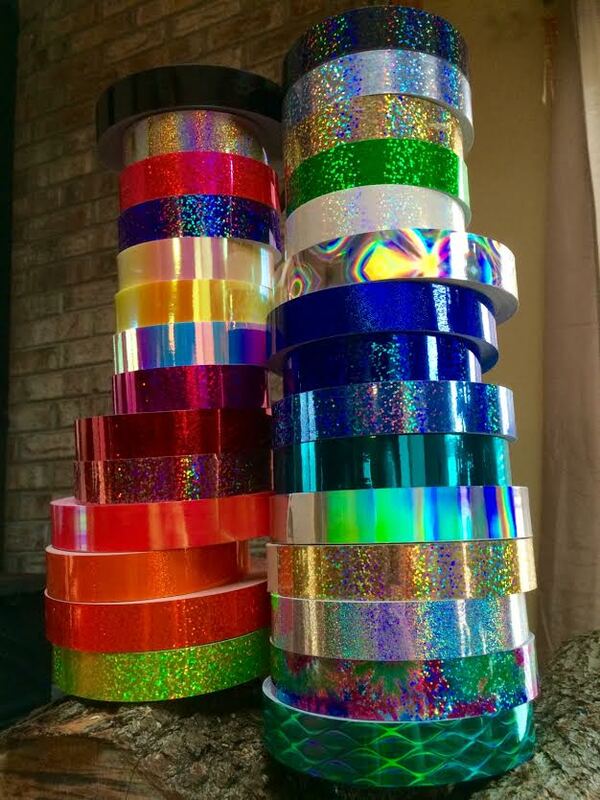 We carry grip tapes in 1/4″, 1/2″ and 1″ in all colors. To see a full photo album of all of our current tapes, look at them over at the Performance Hoop listing. Click here for pictures of our HDPE tubing and here for our polypro tubing. You can also send us a message anytime on Facebook to discuss your dream hoop before ordering! 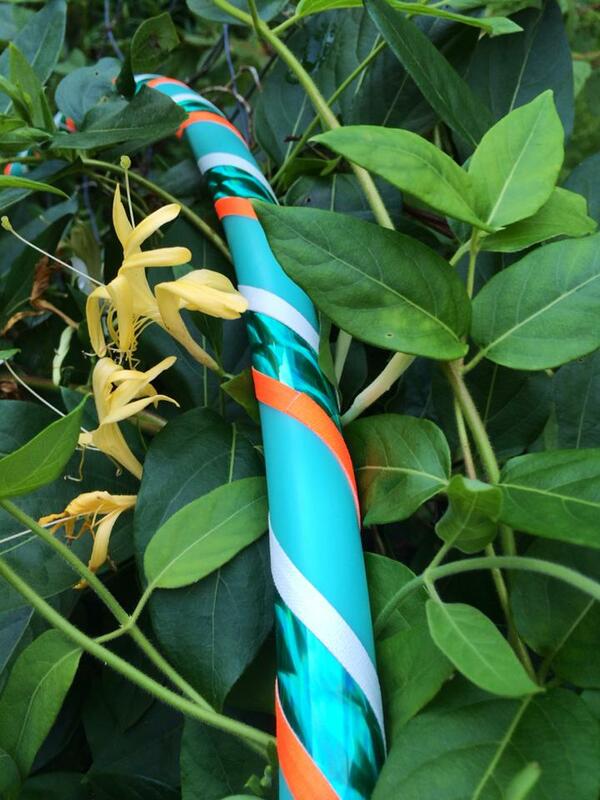 We love to make custom hula hoops! 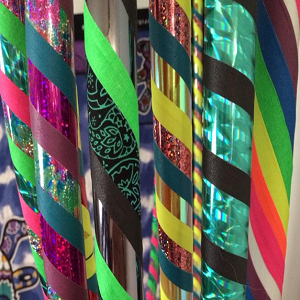 We can create pretty much any hoop you can dream up. 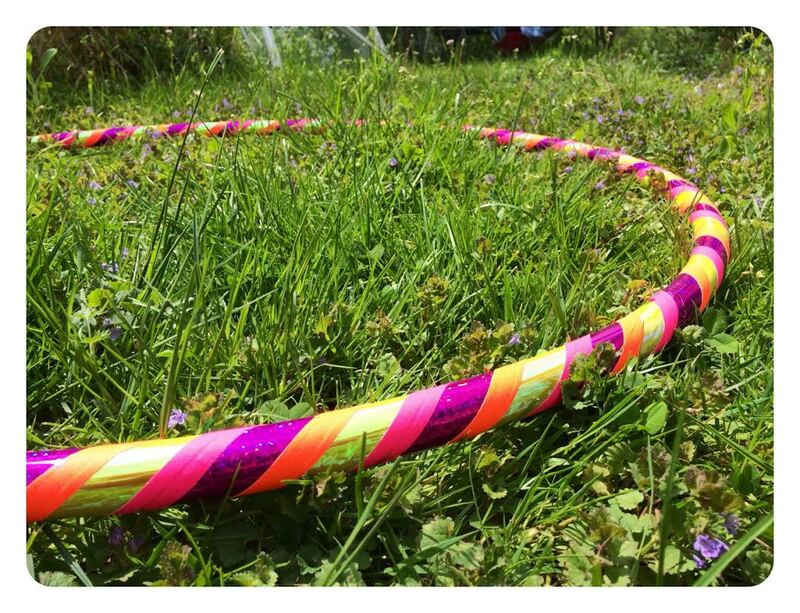 Create a hoop that will inspire you and let your personality shine. IF YOU DO NOT WRITE IN THE NOTES DURING CHECKOUT EXACTLY HOW YOU WANT US TO MAKE YOUR HOOP, WE WILL CREATE A ONE OF A KIND CUSTOM DESIGN FOR YOU! 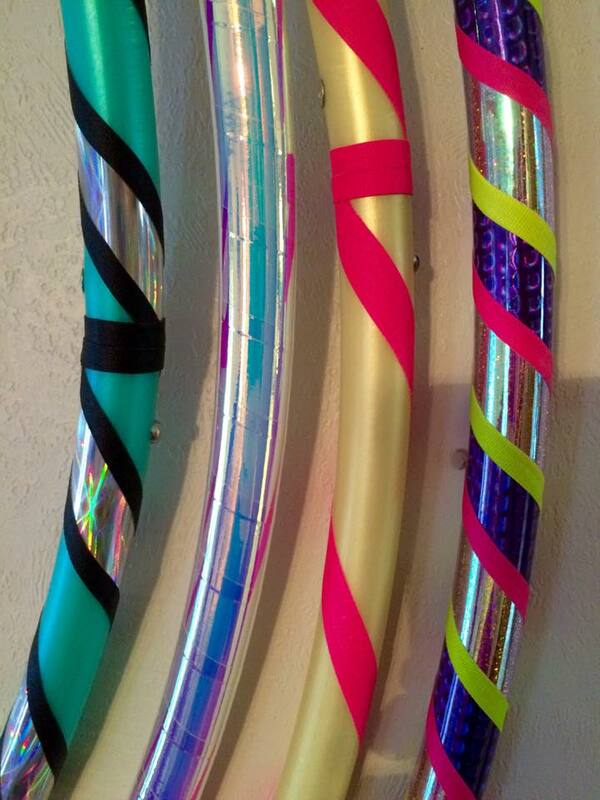 We do not offer returns or exchanges on custom created hoops. 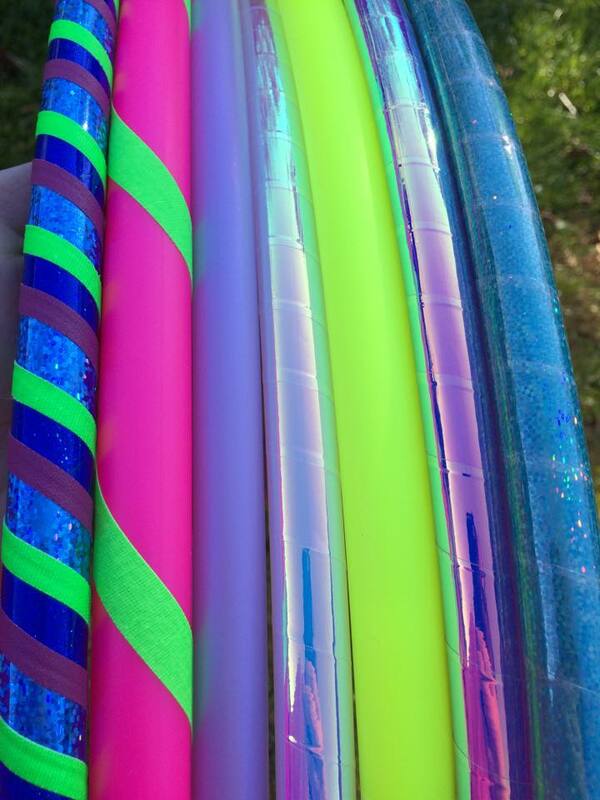 All of Ruby Hooping’s hoops are collapsible for shipping and travel. PE hoops collapse infinity style and all HDPE/polypro hoops open with the push of a button and can be coiled down and reconnected. You can view instructional videos here. I love my Rainbow hoop from Ruby Hooping. I’ve fallen in love with hooping and cannot wait to order an LED hoop as well! (Which I had the pleasure of sampling and they could not be more colorful and bright and fun than you can imagine.) Just let your hoop dreams known and they can create the perfect design for you! I got my hoop today and I LOVE IT! I have to figure out how to do it now – thank you so much! I’m gonna work at it! I have kept it going for a few seconds at least. It sure seems fun! I love my hoop. I really didn’t believe I would be able to do it and I’m surprised at what a great workout it is! As soon as I got up this morning I was ready to practice. Thank you Lindsay!!! I’ve never had a “waist” before so I’m thrilled to find something that will help me tone there!!! My husband isn’t even allowed to touch my “muffin top.” Maybe I’ll fit into women’s jeans this summer! I should add that I looked up exercises that target the waist area and hooping was one of the first things that came up. I was sold! Also, I am one of the most uncoordinated people you could meet. If I can do this in two days almost anyone can. Five stars! I initially ordered just a black hoop on sale to try it out and the outcome has been phenomenal for me. I now own 3 hoops of my own and have began hooping pretty much on a daily basis as an added workout component to my already strict regimen of lifting weights, kickboxing and spinning/cycling. Hula hooping though has become my come down of sorts; my calming factor. Some people do yoga or Tai Chi, I hula hoop. When I get home from the gym, I hoop during TV watching and to massage my body after working out. It feels great and now I have several friends who have joined me in my hooping endeavors. It helps that I bought them each one and we take them to game nights and bbq’s for added fun! Oh! Don’t let me forget to mention the custom colors are awesome, especially when they can be so individualized to each individual’s personality. It makes hooping all the more fun! And they make great gifts!!! I am absolutely in love with my custom hoop! Very well made and exactly as I imagined it. Hoop is conveniently collapsible for travel so I never have to be without it. Tubing and tape are even more gorgeous in person than they are on the site’s photos and I’m endlessly impressed with how smooth and perfect the tape job was. Not only is my hoop absolutely amazing, but Ruby Hooping’s super awesome hoop artist extraordinaire was very helpful in helping me as someone new to hooping decide exactly what I needed and wanted in terms of diameter and tubing and also in constructing my design. I absolutely appreciate how patient and informative she was with my million questions. Hoop arrived very fast and even showed up on my door a day ahead of schedule. Wonderful experience. Will definitely be ordering from here again! I ordered a Superman inspired hoop from RubyHooping and I received it in a timely manner! I love it! It’s so pretty and perfect for me! I will probably end up ordering more hoops at a later date! Hooping is a great way to lose weight! Lindsay is amazing to work with! FIVE STARS! 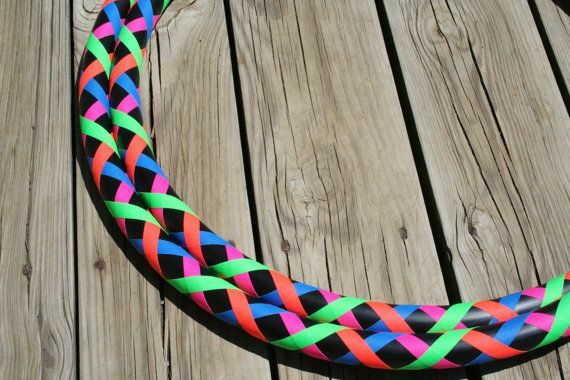 I ordered my first HDPE Hoop from Ruby Hooping, I just want to let everyone know that I did a lot of research before I chose them to make my hoop. Because this was going to be a very special hoop for me. I am a Brest Cancer Survivor and on 09-14 I just had my 3 year DX anniversary. The reason the hoop is special is because I found out about my Cancer just 10 days before my dream beach wedding. So to celebrate my life as a whole, I wanted a Wedding Dress inspired hoop. I chose Ruby Hooping mostly because I know that her heart is in her work and that is very important. We people love what they do, they have better outcomes. And, I LOVE, LOVE, LOVE my hoop. It was going to be just a performance hoop but now it is my go to hoop almost every time. I land tricks so much easier with the HDPE than the poly pro, I am progressing a lot faster, all because of my most awesome hoop. I now have had two hoops made by Ruby Hooping, one for me and one that was a wedding gift for a close friend. Let me tell you that both of the hoops were perfect upon arrival and still are. I can’t speak for the gifted hoop because its enjoying Cancun right now, but mine quickly became one of my go to hoops. I am not necessarily gentle with my hoops, and this one has always remained a true circle. I have one of the orange UV hoops and it is by far the brightest UV hoop I have, not only under a blacklight but in the sun too! I’ll never be afraid to send anyone to Ruby Hooping as I know Linz has the eye for detail I look for in a hoop maker! I look forward to doing more business with this shop in the future! I received my first HDPE in the mail a day earlier than expected, I was ecstatic to come home and find it waiting for me. It has easily become one of my favorite hoops. Everything about it is perfect, and I mean everything, from the perfect push button connector, to the tape, to the feel, and the weight. The customer service is also top notch! They don’t just don’t take your order and ship you a hoop, they take the time to get to know you. They’re excited about everybody’s hooping journey. Before placing my order I spoke with Linz about what design I wanted and she was more than helpful through the whole process! And instead of just sending a generic e-mail with the tracking number, I got a personal message from on facebook informing me it was on it’s way and the tracking number. I love my polypyo but I have definitely fallen into the HDPE revolution that Linz and Cecil have start and I couldn’t be happier. I will most definitely be ordering from here again very soon! I LOOVEEE MY HOOPS! They came out wonderful and arrived within 5 business days. I had a few questions before placing my order and she immediately emailed me back within the hour. Terrific customer service and great quality hoops. I’m happy to say that I ordered one of my friends her very first own hoop through ruby hooping and would recommend to anyone! beyond a five star rating and I will be coming back for my next hoop as well as recommending the company to other people. Thanks so much Ruby Hooping! I have another hoop to love!!!! This one had to be a doozy for Linz and Cecil because I could not decide what I wanted for my tapes! So I sent Linz a picture that included the colors I thought I wanted and told her to have at it! Talk about customer service! She was so sweet and kind when I couldn’t make up my mind! And she and Cecil did an absolutely amazing job! I love hula hooping and nothing is better and more motivating than having beautiful hoops to look forward to everyday!!!! Thanks Again Ruby Hooping!